Most teenagers would not walk 26 miles for a book, but 200 years ago an extraordinary 15-year-old girl in Gwynedd did just that. In 1800 Mary Jones walked barefoot across the hills from Llanfihangel-y-Pennant to Bala to buy a bible which she had saved six years for. Now a £1.3m visitor and education centre is to tell her story. 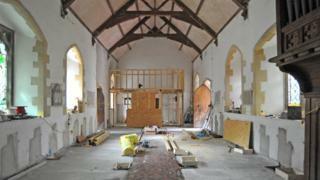 Mary Jones World has opened in the renovated former St Beuno's Church at Llanycil on the edge of Lake Bala. Centre manager Nerys Pritchard told BBC Radio Wales she hoped it would "cater for every age and every sort of knowledge". Mary Jones World will use videos, panels and interactive screens to tell her story and hopes to attract young visitors with its "modern vibe". A decade ago the redundant church was up for sale and could have become a canoe store. Now the cultural centre hopes to bring in 10,000 visitors a year. Mary Jones decided at the age of nine to save up for the trip to Bala where she met Rev Thomas Charles. Inspired by her commitment, he encouraged people in London, including William Wilberforce, to help him set up the Bible Society, which has now spread to 200 countries. Christine Daniel, head of the society, which built the new centre, said it would teach people the "impact Wales has had on the world". "People from around the world... know the story of Mary Jones and are grateful to Wales for that gift of the bible," she added. Lona Puw, who lives nearby, said the decision to create the cultural centre was "an answer to a prayer". "This is our heritage and I cannot let it just go," she added. An opening ceremony attended by 300 guests, including church and civic leaders and descendants of the Mr Charles took place on Sunday, the bicentenary of his death. The opening was also marked by a procession from Capel Tegid in Bala to the centre. Hear more about Mary Jones World on All Things Considered from BBC Radio Wales.